BINGHAMTON - The Binghamton Devils announced today that the club has acquired forward Alex Krushelnyski from the Lehigh Valley Phantoms in exchange for future considerations. The announcement came from Binghamton's general manager, Tom Fitzgerald. 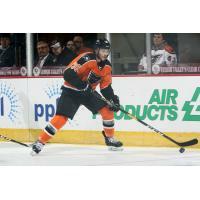 Krushelnyski, 28, has two assists in 20 games this season with Phantoms. The 28-year-old forward has compiled six goals, 13 assists and 36 penalty minutes in 106 career American Hockey League games with the Norfolk Admirals, Hartford Wolf Pack, Binghamton Senators and Lehigh Valley Phantoms. The 6-foot-0, 180-pound forward has amassed 69 goals, 112 assists, and 124 penalty minutes in 188 career ECHL game with Wichita, Allen, Utah, and Reading. Prior to his professional career, the Los Angeles, CA native played four seasons at Colorado College and served as the team's assistant captain his senior year.